Throughout my school life I remained immune to the charms of needlework, a compulsory subject at my convent school in India. I have memories of my mum staying up the night before the final exhibition frantically sewing pillowcases, tray cloths, knickers or a hand towel. As an adult, though, I was strangely drawn to embroidery, but because of my school memories, just did not have the confidence to start it, even in the privacy of my own house. I then came across a project in an embroidery book, which intrigued me. 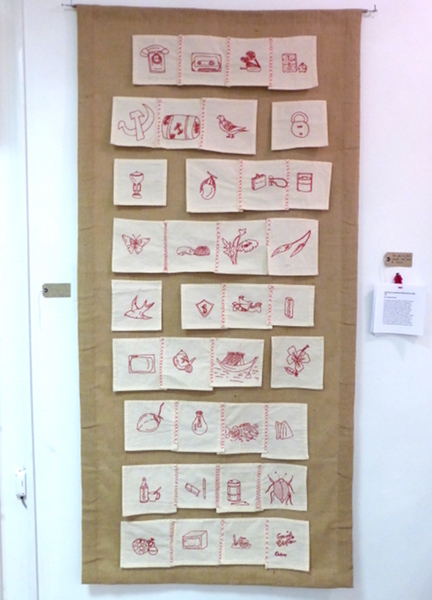 This was ‘Red Work’ – a two dimensional patchwork of squares with objects embroidered in each square. As the name suggests, various objects, animals, insects and birds etc were embroidered in single colour stranded red cotton. Red work originated in America in the 19th century and was popular as a way of teaching young girls to embroider. They started by buying a square of linen with a skein of cotton and a design transfer. The squares were then sewn together to form a wall hanging or a table cover. The simplicity and naivity of the designs are part of its appeal and they remain important primary sources for social historians. The real attraction of red work to me was the unavoidable get out clause: I could only sew a few squares and then give up. Not the most promising of starts. But something strange happened when I started. It really grew on me – and after starting with a few of the designs from the red work design bank, I changed tack and made it a collection of objects from my own life: a collection of short stories. I have thoroughly enjoyed the whole process (it took me three and a half years to complete) and have now embraced embroidery as a very satisfying way to end a day. All my projects now are short term ones though…Enjoy some of the stories below. This was used by my dad every morning in an old style stainless steel heavy razor. I used it to secretly sharpen my pencils. This was naturally forbidden by school, but most of us disobeyed because it was the best way to create a really sharp point. My dad also discovered that razor blades were the most efficient way of slicing tomatoes- surgical precision with the exact pressure to avoid a collapsed fruit. This was a revelation – and made sandwiches for school lunches so much more efficient! I crossed the River Hooghly (a distributary of the River Ganges) every day for five years to go to school. The dinghy was a little sturdier than it appears and isn’t like its namesake in this country. It carried a dozen teenagers for at least two miles up and downstream, battling strong currents, wind and monsoon downpours. I loved it when we were sailing against the current because it meant the boat had to hug the river bank all the way until it was ready to cross. In India all of life is on the river bank. I saw sadhus (ascetic holy men) emerge from ten year penances, impromptu schools for ragged children and even the dead being cremated. All this on a school trip. We started using fountain pens in middle school – at age nine. Using one marked you with a little inky bump on your ring finger where it pressed against the pen barrel. Using a pen was so much more grown up than a pencil – calling for surgical precision which involved an eye dropper, some rags, blotting paper and of course a bottle of ink. Really good fountain pen nibs were like gold dust; if you found one that worked, your writing just flowed. They were also quite unpredictable, sometimes flooding test papers with great blobs of inky tears that mirrored the writer’s despair. That drawing was supplied by my mum and was a huge shock to me as her choice. My mum taught ICSE (equivalent to GCSE) English and I along with pretty much everyone else assumed her passion to be English Literature. What I didn’t know was she had always wanted to be a botanist (hence the hibiscus, a staple botanical drawing in India). This drawing betrays her first love and showed me a completely new side to her. The best armour against scorching 40 degree heat was knife edged trouser crease, razor sharp skirt pleats and collars so stiff they held your neck upright. This could only come from the dhobi’s iron. We all suffered from dhobi itch and our clothes were marked with mysterious inky symbols (which meant no one ever lost clothes or even ended up with some one else’s), but these were a small price to pay for a military standard deportment. My dad was a jute technologist and trained in Dundee. I grew up in one of the many jute mills that line the banks of the River Hooghly. Jute was brought in as fibres and woven into carpet backing, gunny bags and shipped in barges to Calcutta, the main port. Growing up surrounded by jute has given me a lifelong love of textiles. I have used hessian as the background to my redwork because it is such a fundamental part of my life story. I started Enid Blyton when I was nine years old and was immediately hooked. My mum used to bribe me to study by promising me a book everytime I came first at a school test. As these were weekly, I slowly amassed an impressive collection. So I have her to thank for my education! And of course, the ultimate in luxury was a bar of Cadbury’s Fruit and Nut while devouring the latest exploits of George and Julian in far off England.